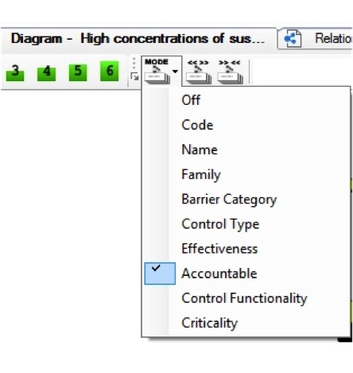 You probably already know about assigning information to the Barriers in your diagrams according to the various dropdown lists in the Barrier Editor window (things like effectiveness ratings and the accountable post holder). But did you know that there is a very simple way to group (or bundle) the Barriers in your BowTie according to those criteria? This gives us interesting options for interpreting and displaying the information that we already have in our BowTies. An interesting feature that was introduced to the BowTieXP software in version 8 might have escaped your attention. It was a fairly inconspicuous little shortcut button labelled ‘mode’ and you will find it next to the green ‘level of detail’ shortcuts icons. Once you click on this shortcut you will see a dropdown list of options for bundling the barriers. Barriers with the same characteristics, like Accountable can be bundled together using this feature. So if we want to show the Barriers according to who the accountable post holder is, just select that option and viola! 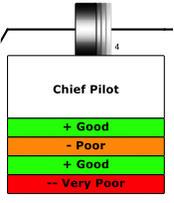 When the Barriers are bundled like this (by ‘accountable’ in this case) we can see the number of Barriers in the bundle by referring to the value shown next to the Barrier bundle and we can also see the results of the effectiveness ratings for each of the accountable post holders’ barriers. By the way, once bundled, when we hover the mouse over the Barrier bundle we will get a little plus symbol which will allow us to expand out that particular bundle and see the individual Barriers in it. There are lots of ways to use this feature. For example on the the UK CAA Significant Seven BowTie Project (for which Across were the lead consultants) (see http://www.caa.co.uk/Safety-Initiatives-and-Resources/Working-with-industry/Bowtie/) we used a Barrier categorisation called ‘Functionality’ which highlighted whether a Barrier was intended to ‘eliminate’ the Threat, ‘prevent’ the Top Event, ‘reduce’ the likelihood of the Consequence, or ‘mitigate’ the severity of the Consequence. With the Barriers bundled in this way we get an easy to interpret overview of how we are approaching the issues i.e. how much attention are we putting on eliminating the Threats and how effective are those measures. Another powerful way to use this feature is to bundle barriers together according to the system they collectively form. We may have several components to a fire suppression system for example. 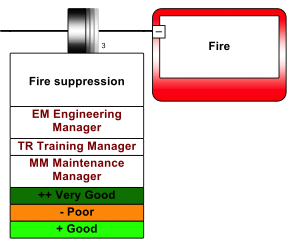 We could have one Barrier in our BowTie that simply says ‘fire suppression’ or we might show the individual components of that system as a series of barriers. We might want to do this so as to highlight the different accountable post holders or because the different barriers have different effectiveness ratings etc. We now have the option of allocating the Barriers to a so called ‘family’ in the Barrier Editor window. Whenever Barriers have the same family name, we can bundle them using this new feature and in so doing, simplify the complexity of larger BowTies when we find it desirable.